The BL Lac object PKS 0447-439 is one of the brightest blazars in the Fermi sky (Abdo et al. 2009). 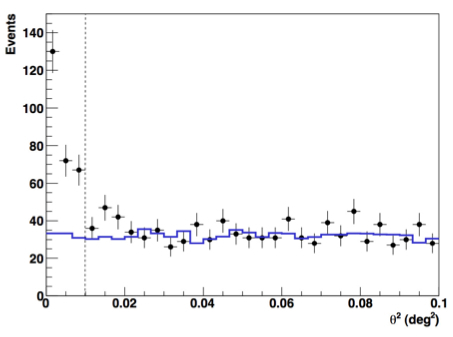 A redshift of z≈0.205 was claimed for this object, but is based on very weak spectral features (Perlman et al. 1998). The most recent study by Landt & Bignall (2008) provides only a lower limit of z > 0.176 based on photometric estimates. In about 13 hours of H.E.S.S. data taken mostly in December 2009, a highly significant gamma-ray signal is detected (Fig. 1), with a flux of about 4.5% of the flux of the Crab Nebula (above the energy threshold of 250 GeV). While there are indications of a higher flux in December 2009 as opposed to November 2009 or January 2010 (Fig. 2), no statistically significant variability can be claimed. The top image illustrates the broad-band electromagnetic emission from PKS 0447-439, ranging from radio to very high energy gamma rays. The spectrum shows the double-humped shape characteristic for blazars, with a pronounced change in spectral slope between the Fermi and H.E.S.S. energy ranges. Whereas PKS 0447-439 is a hard-spectrum Fermi source (with a spectral index of 1.9), if is one of softest H.E.S.S. sources, the spectrum steepening to an index of about 4.4. The change in spectral slope can reflect the spectral distribution of the particles accelerated in the AGN, but it could also be due to absorption of photons by the extragalactic background light, which increases strongly both with photon energy and distance of the source (see e.g. SOM 2005/12). This allows placing an upper limit on the redshift of PKS 0447-439: if the spectral shape measured in the Fermi energy range would continue without intrinsic spectral break into the H.E.S.S. energy range - a very optimistic assumption - than for redshifts beyond z = 0.53 the spectrum at very high energies would be even softer than measured by H.E.S.S. (Fig. 3), excluding such high redshifts. Fig. 1: Distribution of gamma ray candidates relativ to the direction towards PKS 0447−439. 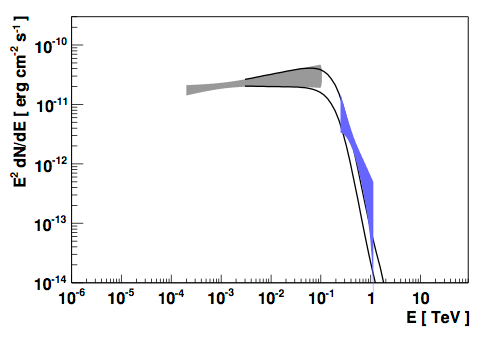 The background estimate is shown by the blue line. Fig. 2: H.E.S.S. light curve from November 2009 to January 2010 with a constant fit to the December data (dotted line). Fig. 3: Fermi LAT spectrum (grey "bowtie"), extrapolated to the H.E.S.S. 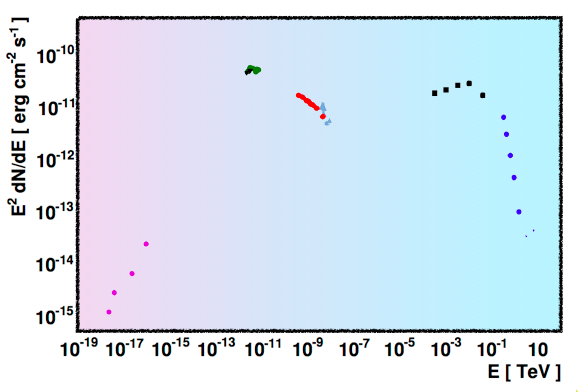 energy range, taking into account photon absorption in interactions with extragalactic background light assuming a source redshift z=0.53 (black lines), in comparison with the measured H.E.S.S. spectrum (blue "bowtie").